It is with our deepest regret to inform you the media of the Line Of Duty Deaths for Fire Captain Tedmund “Ted” Hall and Firefighter Specialist Arnaldo “Arnie” Quinones. These two members tragically lost their lives when the where overran by a fast moving fire which approached Fire Camp 16 on the “Station Fire” Incident. Fire Captain Tedmund “Ted” Hall was 47 years of age and was a member of the Los Angeles County Fire Department for 26 years and lived in San Bernardino County, California. Firefighter Specialist Arnaldo “Arnie” Quinones was 35 years of Age, and was a member of the Los Angeles County Fire department for 8 years and lived in Palmdale, California. Funeral arrangements are pending and information relating to services will be made available in the near future. 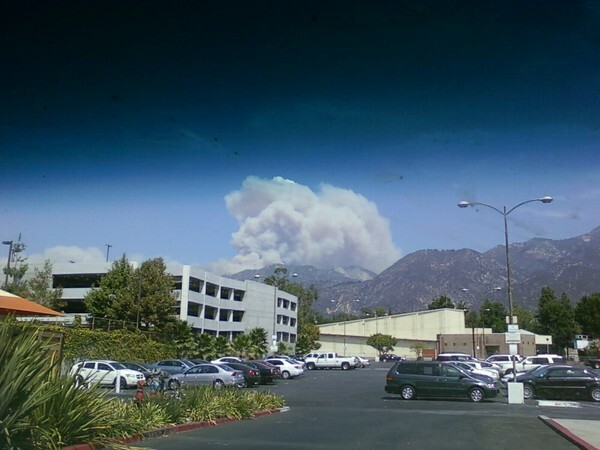 August 31, 2009 9:00 a.m.
Summary: The Station Fire continues to burn within the Angeles National Forest and near surrounding foothill communities of La Canada-Flintridge, La Crescenta, Acton, Soledad Canyon, Pasadena and Glendale. The goals of the firefighters are to keep the fire west of Highway 39 and Angeles Crest Highway, east of Interstate 5, south of Highway 14, Pearblossom Highway, and Highway 138, and north of the foothill communities and the Angeles National Forest Boundary. Steep terrain, decadent old growth brush and hot dry weather are factors that drive fire activity. Firefighters are working to build fireline and protect structures within areas affected by the fire. Acton Area: There has been a mandatory evacuation of Soledad Canyon Rd. between Agua Dulce Canyon Rd. and Crown Valley Rd. There is a mandatory evacuation of the area bounded by Soledad Canyon Rd, Aliso Canyon Rd. and Angeles Forest Highway. National Forest: Soledad Canyon Rd./Bootlegger Canyon Rd. Area AND Little Rock Recreation Area Mount Emma Rd. and Cheseboro Rd. National Forest: There has been mandatory evacuation of the area along Big Tujunga Canyon Rd. from Mount Gleason to Angeles Forest Highway. There has been a mandatory evacuation along Little Tujunga Canyon Rd. north of the Little Tujunga Ranger Station and Gold Creek. La Crescenta: Vicinity of Rosemont, La Crescenta, and Ramsdale AND north of Rockedell, Pineridge, Mountain Pine, and Markridge Rd. La Canada Flintridge: There has been a mandatory evacuation of all streets east of Ocean View Blvd. and north of Los Amigos St. In addition, all streets north of Jessen Drive and Palm Drive have been evacuated as well. There has been a mandatory evacuation of all streets located west of Briggs Ave. and east of Pennsylvania Ave., in between Harmony Pl. and the foothills. There has been a mandatory evacuation of all streets north of Rockdell St. between Briggs Av. And Pine Glenn Rd. Altadena: There has been a mandatory evacuation of all streets north of Loma Alta Dr., located between Lincoln Ave. and Lake Ave. In addition, all streets located in “The Meadows” have been evacuated as well. “The Meadows” consists of all streets located above Loma Alta Dr. and west of Lincoln Ave. to Aralia Rd. Soledad Canyon Rd. @ Crown Valley Rd. Placerita @ Sand Canyon Rd. Aliso Canyon @ Soledad Canyon Rd. Angeles Forest Highway @ Mt. Emma Rd. Red Rover Mine Rd. @ Escondido Rd. Lake Blvd. to JPL and south of Cheyney Tr. Evacuation Shelters: Located at La Canada High School; La Crescenta Valley High School and Golden Valley High School, Marie Kerr Park, Verdugo High School. Animal Shelters are located at Antelope Valley Fairgrounds, as well as the following special needs shelter. Pierce College (horses, donkeys and mules ONLY), Lancaster Animal Shelter and Agoura Animal Shelter are both accepting small animals. Very heavy fuels of ceanothus, chamise, scrub oak and manzanita across the entire fire area, 15 to 20 feet in height with Big Cone Douglas Fir in the drainage bottoms. Fuels have not experienced any significant large fire activity in the past 40 years. Fire behavior was extremely active with rapid rates of spread and flame lenghts up to 80 feet. All thresholds in place for determination of active fire behavior have been exceeded. Hot and dry with afternoon winds, especially over the upper slopes. Mandatory Evacuations are in effect in many locations. The fire is threatening the Mount Lukens Communications Site, Mount Wilson Communications Facilities and Observatory and may reach these locations this burning period. Unified Command is in place. Prepare and protect structures when and where necessary. Air operations will be heavy on the northwest perimeter. Extreme. The fire in the Acton area has spread down to the lower slopes adjacent to the road. Angeles Crest Highway remains closed and is the primary access route for numerous private residences and the Mount Wilson Communication Facility and Observatory. Multiple evacuation centers have been established. The Red Flag warning will expire at 9:00 p.m. the evening. announcing an immediate mandatory evacuation notice for residences on: Ocean View Blvd. Rd. n/o El Vago St., Hacienda Dr., Linda Vista Dr., and Alta Canyada Rd. n/o Linda Vista Dr.
depart in a safe manner. According to Mr. John Velasco of JPL, the Lab will be closed until at least Sunday evening. SCE cannot enter this area due to fire danger. There is no clear boundaries to the area being evacuated in Altadena. Watch commanders at both the Altadena station and Crescenta Valley are not taking phone calls. No one has communicated with the HQ Bureau about the boundaries of the area in Altadena under mandatory evacuations. Sheriff’s are enforcing some sort of mandatory evacuation nonetheless. Here’s what seems to be happening. Homes north of Loma Alta are under orders to evacuate. The eastern and western boundaries remain unclear, although the La Vina neighborhood at the top of Lincoln Avenue has been evacuated. Very heavy fuels of ceanothus, chamise, scrub oak and manzanita across the entire fire area, 15 to 20 feet in height with Big Cone Douglas Fier in the drainage bottoms. Fuels have not experienced any significant large fire activity in the past 40 years. Friday behavior was very active to extreme, with rapid rates of spread and flame lenghts up to 80 feet. There is a potential for Saturday’s fire behavior to be similar to Friday. Around noon Saturday, after the inversion has lifted, expect actively spreading fire with upslope runs. Spotting may occur from 1/4 mile up to 1/2 mile. 3 Mandatory Evacuations as of early Saturday morning include Starlight Crest Drive north to Green Ridge Court, including Forest Green Drive, two, Big Briar Way at Haskel, and third, Donna Maria Lane, Indian Drive, Hacienda Drive, Alta Canada Rd., North of Linda Vista, La Canada Blvd. north of El Vago Street. Evacuation Center: La Canada High School, 4463 Oak Grove Drive, La Canada, CA. Angeles Crest Highway remains closed. Prepare and protect structures when and where necessary. Construct handlines and dozer lines. 1800 homes threatened. 27 commercial properties and 52 other stuctures threatened.